Both human and sea life are harmed by this overconsumption. The new year saw a new law on straws implemented in California. Signed by Gov. Jerry Brown in September 2018, the new law states that anyone who would like a straw for their drink must ask instead of automatically being given one. While sit-down restaurants will be affected, fast food joints and coffee shops – the main culprits – will not. Although this law should cut down on ocean pollution, it only addresses half of the issue. Full-service restaurants are only a fraction of the problem, and a better way to reduce harmful plastic is to eliminate all plastic straws. Fast-food joints and coffee shops continue to use straws without customer request. Coffee shops are most responsible. According to the U.S. National Park Service, the United States alone uses more than 500 million disposable straws per day, and a large fraction of it comes from coffee shops. Both of these places allow customers to grab as many straws as they want, even if they do not need that many. So when they are finished eating, they often throw the extras away, leading to more waste. Since straws are made of thin plastic, they can break apart into smaller pieces known as microplastics. These particles have negative impacts not only on ocean life but on humans too. According to an October 2018 article published by National Geographic, researchers have recently confirmed the presence of microplastics in human feces. Some have known that plastic straws were a threat since they were introduced in the 1880s. 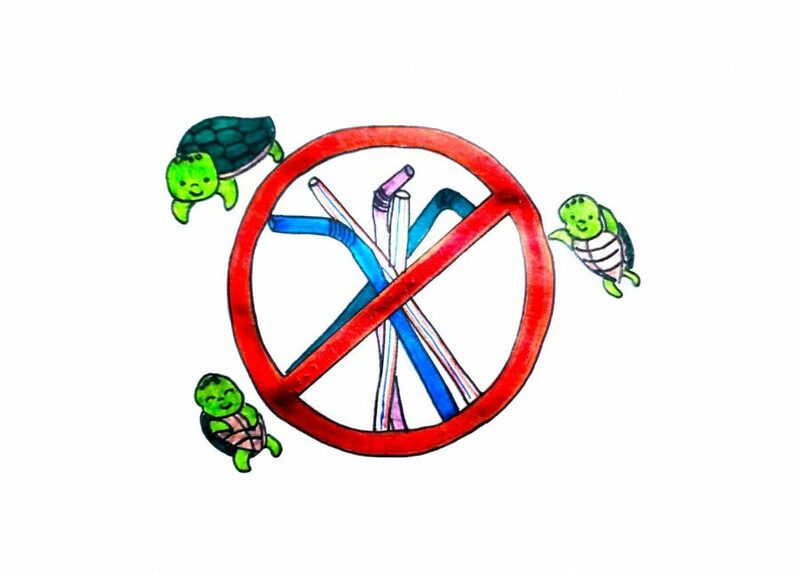 However, when a 2015 YouTube video of a turtle with a straw up its nose resurfaced on social media, many people began to rethink their plastic straw usage. Plastic can take up to 1000 years to decompose, according to an article about landfills by Rick LeBlanc. Straws can easily be blown away by the wind, leading them to end up in oceans, rivers and lakes, where animals ingest them, thinking they are food. This is potentially fatal. Eliminating plastics straws completely will prevent situations like this from happening in the future, saving ocean life and benefiting humans. Many people have already found solutions. Boycotting plastic straws in any restaurant, full-service or not, and purchasing reusable, portable straws are some ways one can help address this issue. Starbucks plans on replacing their plastic straws with plastic drinking lids by 2020. According to an article by Wil Fulton regarding the strawless lids, they are said to eliminate one billion straws per year, and their new lids are made of biodegradable polypropylene content. Although it is still plastic, it is progress. While both of these solutions address the problem, straws will still be produced and will still be an issue. The work towards putting an end to plastic straws is not over. A large fraction of the problem is not being addressed with this new law since fast-food restaurants and coffee shops will continue to offer plastic straws to their customers. Although California is taking a step in the right direction, the only way to see a difference is if all plastic straws are eliminated completely.